We were about to cook a New Year’s Eve feast until we came across a seductive menu from Triomphe, a restaurant in midtown Manhattan. Executive Chef Jason Tilmann has assembled stunning flavors and visual excitement, making this the menu we want to eat on New Year’s Eve. Makes his whole Life but one continual Dinner. Let Chef Tilmann’s menu inspire your own thoughts for New Year’s Eve dining. And may the richness of your dinner inspire restraint in the new year—at least, until Valentine’s Day. 1. ENVY: a feeling of discontent or covetousness with regard to another’s advantages, success, possessions, etc. Dish: osetra caviar, buckwheat blini, onion, egg and chives. 2. VANITY: excessive pride in one’s appearance, qualities, abilities, achievements, etc. 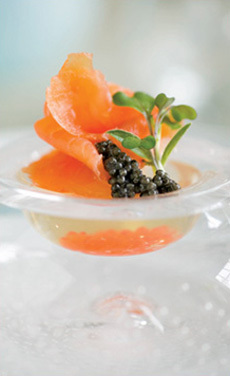 Even if you can’t make complex dishes like Triomphe’s, you can combine ingredients simply, like smoked salmon, salmon caviar (at the bottom of the dish), black caviar, a dab of crème fraîche and an herb garnish. Photo courtesy Tsar Nicoulai. Dish: lobster dumplings, wakame salad and ginger butter. 3. WRATH: strong, stern or fierce anger; deeply resentful indignation; ire. Dish: spicy prawns, lemon, roasted garlic and herbed risotto. 4. GLUTTONY: excessive eating and drinking. Dish: Pol Roger champagne sorbet, gold leaf and crispy grapes. 5. SLOTH: habitual disinclination to exertion; indolence; laziness. Dish: slow-cooked cassoulet with duck confit, slab bacon and white northern beans. 6. GREED: excessive or rapacious desire, especially for wealth or possessions. Dish: smoked Kobe tenderloin, fingerling potatoes, asparagus and bordelaise sauce. 7. LUST: an overwhelming desire or craving. Dish: Valrhona chocolate soufflé with Grand Marnier crème anglaise. These seven “sinful” courses are certain to engender a day of restraint on January 1st.